Posting your first kiss and details of your romantic life on social media sites is no longer considered exploitative. It's actually expected. But where do you draw the line between kiss-and-tell and kiss-and-post? Posting your first kiss and details of your romantic life on social media sites is no longer considered exploitative. It's actually expected. But where do you draw the line between kiss-and-tell and kiss-and-post? With marriage proposals appearing on Twitter and couples breaking up on Facebook, it can be confusing for even the most romantic of hearts. In recent Zoosk surveys, over 6000 singles and those in committed relationships were asked how they felt about sharing juicy details on Facebook and Twitter about their love lives. Their findings showed that over 60% of Americans actually are concerned about how these posts could affect their jobs and err on caution if they're friends with co-workers on Facebook. Does that mean that texting and romantic posts are off-limits? Not at all according to the Zoosk surveys, as 81% of the couples are using technology to stay in touch with loved ones throughout the day. 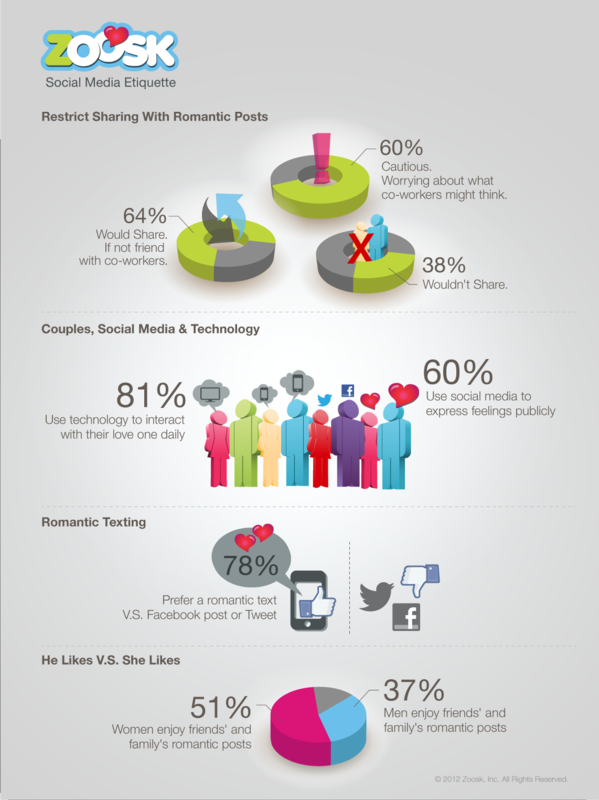 According to Zoosk, texting can be romantic. I have to agree with this one. Sending a flirty text to that special girl or guy in the morning to let them know you're thinking of them or a good night text saying "sweet dreams" can really enhance a relationship, especially if you're involved in a long-distance relationship. I'm a believer that you should share good news such as an engagement announcement on Facebook and think there's nothing more powerful than the Facebook Relationship status change. However Zoosk's surveys showed that over 50% of women enjoy seeing details of their friends' date nights on their social media feeds, while their male partners keep their digital lips buttoned; with only 37% enjoy sneaking a peek at their friends' romantic adventures. Just how much is too much when it comes to sharing on social media sites? If you think your boss or neighbor would be offended with your lovey-dovey updates, then it's probably best to keep it private. Having a discussion with your partner about how you will be using social media is imperative so you can be on the same digital page. In a recent issue of Redbook, I shared a story in the article, Are You That Couple on Facebook? about one of my very own relatives who communicated their private relationship conversations on Facebook. They were both in the same room and never spoke to each other, but used Facebook to tell their 1000 friends that they were hungry and to go make the morning coffee, while commenting on each other's feeds. It became annoying and they were unfriended by several of their digital friends. Still, technology can enhance your relationship through Skype dates, texting and digital flirting. Remember, social media shouldn't be a complete substitute for old-fashioned courtship or you might just find yourself with a digital pen-pal. Picking up the phone to hear someone's voice will never go out of style. Have you ever felt someone's was sharing too much of their romantic lives online? Do you think posting photos and detailed updates about your love life should be off-limits on social media? Julie Spira is an online dating and netiquette expert. She's the author of "The Rules of Netiquette: How to Mind Your Manners on the Web. For more netiquette and dating advice visit RulesofNetiquette.com and CyberDatingExpert.com. Follow @JulieSpira on Twitter.